Diane remembered what she had read in Positive Discipline the First Three Years about acting without words and decided to try it for one whole day. When Diane wanted Seth to stop doing something, she walked over to him, took him by the hand, and kindly removed him. When she wanted him to come to her, she got off the couch and went to him to show him what needed to be done. When he started hitting his little brother, Diane gently separated them without saying a word. We’ve all heard the saying “Actions speak louder than words.” One of the reasons I love to use this tool so much is because it eliminates any regret or guilt on my part. I recently downsized my car and lost my third row of seats. I knew it would be advantageous, in that it would save gas—and a total disadvantage, in that the three boys would be sitting so close together. My boys would argue and bicker about pretty much anything: “He’s looking at me!” “He’s touching me!” “He’s bugging me!” Most parents can understand how annoying and distracting it can be when your kids are fighting in the backseat. I knew that with a smaller car and a long daily commute, I had to teach and then practice this tool of acting without words. During a calm time, I had fun teaching this tool. My husband, Mark, and I love to practice role-playing as a way of helping the kids understand our perspective. It’s also a fun way to bring a sense of humor into a situation and truly engage our children in learning. The two most important rules if role-playing are to exaggerate and have fun. I promise your kids will love this style of learning. To set up our role-play we placed four chairs in the living room (to set the scene for a pretend car) and asked, “Who would like to play Mommy?” My two older boys both wanted to play me—which was perfect, because then they were able to take turns being in the role and observing. We said we were going to role-play two scenes. Scene one would be what happens in the car when Mommy isn’t practicing Positive Discipline. My oldest son, Greyson, played me first. My husband and I started fighting in the backseat. My two younger boys were laughing hysterically. Of course, Greyson did a great job of playing me—it was embarrassing and humbling at the same time to watch him exagerate my frustration in the car. We began the role-play of me driving, and Reid and Greyson joyfully acted the part of fighting. I pulled my chair (car) over to the side. They soon stopped fighting, but it took a few minutes for them to remember that they both needed to tell me they were done fighting and that it was safe to go. Greyson kindly reminded his younger brother by saying, “We both need to say it.” I thanked them and started driving again. We had fun laughing and talking about what we had learned from this role-playing. Now let’s fast-forward to real life. The kids started fighting, and I made the mistake of asking them, “Do I need to pull over?” Of course they said no, but they continued to fight. I then found a safe place to pull over and got out of the car. It was like magic—honestly, they stopped fighting before the car was even in park. I think they were both so shocked by the fact that we were in a parking lot and I wasn’t threatening and yelling at them. 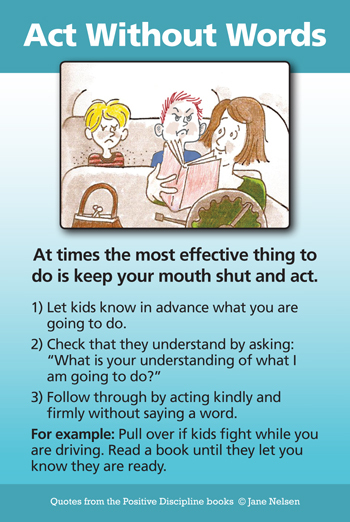 Acting without words is a powerful, guilt-free, and respectful way to parent. It’s amazing how much less I need to apologize and repair when I can just shut my mouth and act. I often remind parents that our kids will test the limits. My advice is to expect this and be prepared. Leave a little earlier to give yourself time to pull the car over the first time you try this.